MOSCOW — Facing a scandal over photographs of its leader wearing an enormously expensive watch, the Russian Orthodox Church worked a little miracle: It made the offending timepiece disappear. Editors doctored a photograph on the church’s Web site of the leader, Patriarch Kirill I, extending a black sleeve where there once appeared to be a Breguet timepiece worth at least $30,000. The church might have gotten away with the ruse if it had not failed to also erase the watch’s reflection, which appeared in the photo on the highly glossed table where the patriarch was seated. 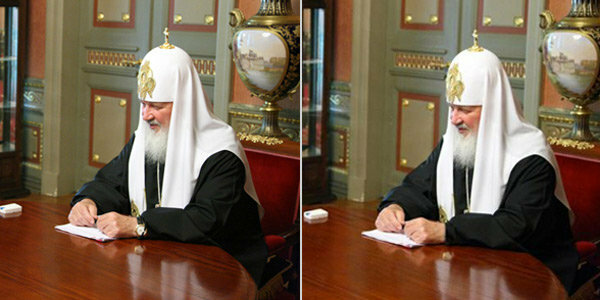 The church apologized for the deception on Thursday and restored the original photo to the site, but not before Patriarch Kirill weighed in, insisting in an interview with a Russian journalist that he had never worn the watch, and that any photos showing him wearing it must have been doctored to put the watch on his wrist. The controversy, which erupted Wednesday when attentive Russian bloggers discovered the airbrushing, further stoked anger over the church’s often lavish displays of wealth and power. It also struck yet another blow to the moral authority of Russian officialdom, which has been dwindling rapidly in light of recent scandals involving police abuse, electoral fraud and corruption. Aleksei Navalny, an anticorruption crusader, called the episode “shameful,” and bloggers gleefully ridiculed the church as hypocritical. It is not likely that the apology will end the debate about the watch or dampen the increasingly barbed discussions of the church’s role in Russian society. Over the past decade, the church has grown immensely powerful, becoming so close to the Kremlin that it often seems like a branch of government. It has extended its influence into a broad range of public life, including schools, courts and politics. Patriarch Kirill publicly backed Vladimir V. Putin in last month’s presidential election. Recently, church officials stoked the ire of Russian liberals by seeking the imprisonment of members of a female punk rock group who held an impromptu concert inside Moscow’s main cathedral in February to protest the church’s political ties. Three members of the group are now in jail awaiting trial. Then there is the question of the church’s wealth. Russian bloggers have published rumors that the patriarch has a large country house, a private yacht and a penchant for ski vacations in Switzerland, though none of this has been proved. The watch, on the other hand, has been an object of fascination for years, and there is little question of its existence. It was first sighted on the patriarch’s wrist in 2009 during a visit to Ukraine, where he gave a televised interview on the importance of asceticism. Coincidentally, the patriarch addressed the watch issue on Sunday, three days before the photo-doctoring scandal hit the blogosphere, in an interview with a prominent Kremlin-friendly television journalist, Vladimir Solovyov. After the rumors about the watch began appearing, “I started looking for it out of interest and horror,” Kirill said, according to Mr. Solovyov, who conducted the interview off camera and related the patriarch’s comments. Sorting through gifts he had received over the years, the patriarch discovered that he did indeed own the Breguet, Mr. Solovyov said. But he insisted that he had never worn it and said he suspected that any photos of him wearing it had been altered with Photoshop. Watches, particularly those of the high-end Swiss variety, have been problematic for the Russian authorities. Many officials have come under fire after being photographed wearing timepieces with price tags far exceeding their annual salaries. Vladimir Resin, a former deputy mayor of Moscow, was once photographed wearing a DeWitt, the Pressy Grande Complication, reportedly worth more than $1 million. While Americans are used to hearing public positions on social issues from religious leaders, they were novel here, and they leave Patriarch Kirill and the church vulnerable to criticism, said Aleksei Makarkin, a political analyst who has written about the church. Russia’s often acerbic bloggers reacted to the scandal with something approaching glee. Bloggers have been uploading their own altered photographs of the patriarch to the Web, including one in which he has been erased and only the watch remains. “Tomorrow, they will be talking about what kind of glasses the patriarch wears,” Father Chaplin said. Who cares what kind of watch the man is wearing? Aren't there bigger things in the world than somebody's watch? PS. I use Photoshop and love it. It's got every feature possible to manage photos. Your country is only what you can take and hold. Diode wrote: Who cares what kind of watch the man is wearing? no one, it was the fact they felt it needed to be hidden........they did base their church on the teachings of Christ after all. The fact that you even ask that question speaks volumes. Could be a $45 knock-off watch. How can you tell from a photo? With PS, anything photographic is possible today. If you have very big bucks, the image can be faked at the pixel level. It would cost thousands of dollars and hundreds of hours to interrogate that kind of image to uncover a fake. Don't believe any image you see today unless you know the photographer.